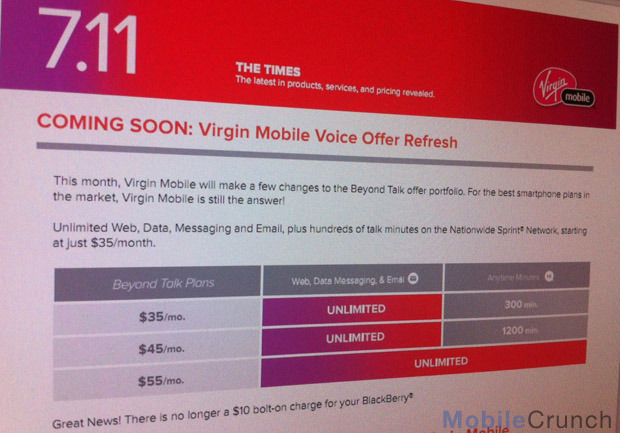 Virgin hikes plans and introduces throttling, just in time for an iPhone? We’ve discussed the next generation ‘value-tier’ iPhone. But we weren’t the first. Apple COO Tim Cook was. While Tim stopped short of explicitly stating that Apple would pursue a lower price iPhone, he did state that Apple was working hard to “figure out” the prepaid market and that Apple didn’t want its products to be “just for the rich,” but “for everyone”; he also stated that Apple “understood price is big factor in the prepaid market” and that the company was “not ceding any market.” ….He further noted that the handset distribution model was poorly constructed and that Apple would look to “innovate” and do “clever” things in addressing that market. That was the WSJ tapping the line (har) of Bernstein Research’s Toni Sacconaghi in February. Today, Virgin announced that it was hiking its data plans to $35/month for unlimited data which coincides with the launch of a big Android phone. But more interesting, to me anyway, was that Virgin is changing its ‘unlimited’ to ‘unlimited with throttling at 2.5GB’ in…October. Beginning in October 2011, Virgin Mobile will also move to reduce data speeds when a customer’s data usage exceeds 2.5GB in a month but still provide unlimited 3G access without a contract, usage cap, overage or activation fees. Based on current usage patterns, fewer than 3 percent of Virgin Mobile USA customers use more than 2.5GB of data usage per month. After reaching this level, this minority of customers may experience slower page loads, file downloads and streaming media. When a customer’s next month begins, the data usage meter starts back at zero with unlimited 3G speeds. If Apple was going to do a pre-paid carrier in the US, it would certainly be Virgin (vs. Cricket, US Cellular, Boost). If Virgin did do iPhone, they’d certainly want to put measures in place to prevent the iPhone from killing its network. We got word yesterday that AT&T was changing its iPhone insurance plans on October 4th, perhaps signaling some new models. With what we had, we’d have given the info about a 25% shot of being legitimate. However, since then, we’ve heard that a big commotion was made about that information being made public. Based on that and today’s Virgin announcement, we’re thinking the probability of that date being right has increased significantly.